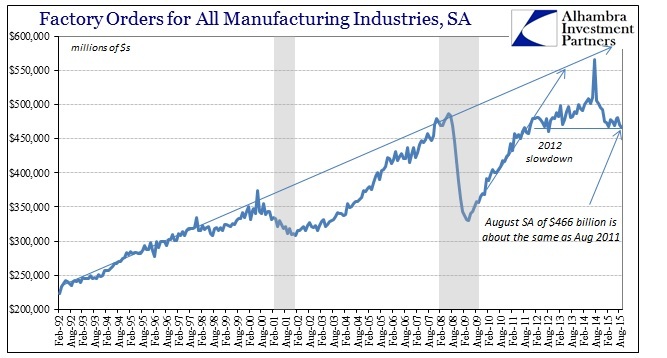 Economists continue to claim that manufacturing just doesn’t matter and that the service economy is more than fine. Setting aside the obvious link between services and goods to begin with (since so many services are dedicated to managing, moving and especially selling goods), it just doesn’t add up; if consumers are freely spending on services then why would they so eschew goods? 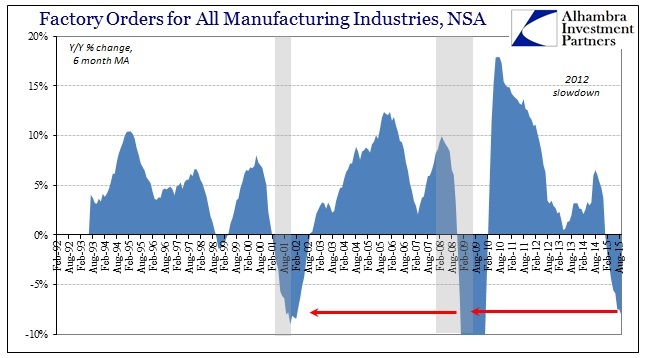 If it were just a minor slowing in manufacturing (which has spread to our trade partners, no less) it would be far more plausible in that manner, but the global goods economy, which remains the bedrock core association, is already showing up in recession form. 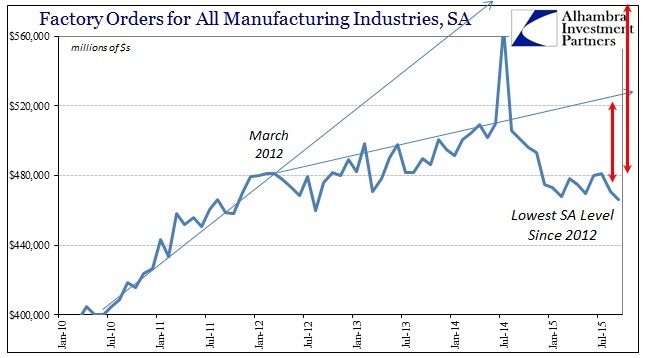 Just in America, manufacturing hasn’t hit a speedbump but rather a conspicuous wall. The latest figures to demonstrate that are factory orders. No matter the version, seasonally adjusted or not, they are recessionary – and have been for more than 6 months now. Not counting the base effects from July 2014 (which produced a -15% Y/Y contraction for July 2015), the other five months of the past six have been, in order, -6.5%, -8.3%, -4.2%, -7.0%, and -7.1% for September. Seasonally-adjusted, factory orders have declined month-over-month by more than 1.1% in each of the past two.  That has the monthly level for orders, a forward-looking economic indication, at the lowest level since the middle of the 2012 slowdown. It took the crash to November 2008 and the bottom of dot-com recession in early 2002 to accomplish that feat, erasing three years of factory gains. 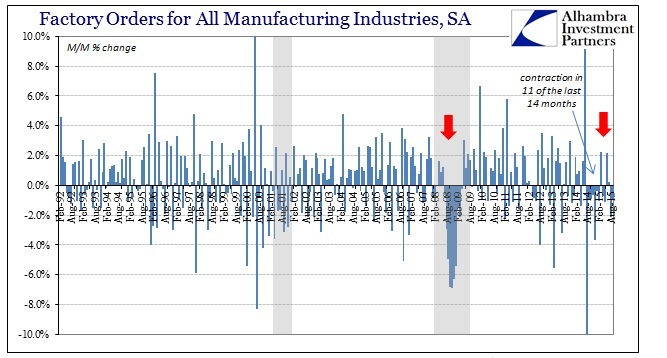 The seasonally-adjusted series has now contracted in 11 out of the past 14 months, leaving the manufacturing economy far behind its needed trend with no end in sight. Recessions are not just contractions but rather accumulations of contractions that persist until the general business environment, that by its nature holds to optimism even without any QE-insanity, is forced to relent in full. 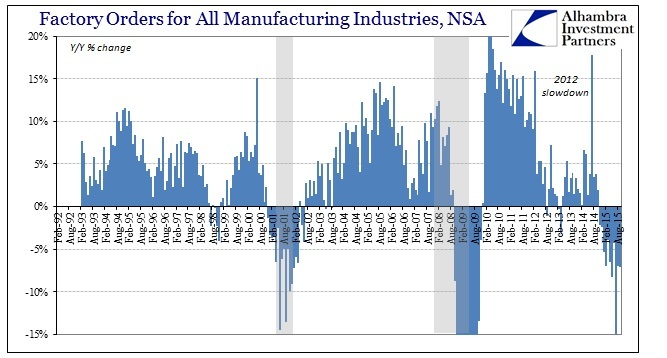 What these figures show is that manufacturing has already been captured by just such a serious contraction and one that has accosted already more than a year (since the prior slowdown trend was broken). With inventory still accumulating but only at a slightly slower pace (which is what “hit” Q3 GDP; inventory is still gaining but now at just near a record pace) the only options left are a sudden and biblical surge in consumerism or where business gives up and shifts to cuts (in production, material and especially labor utilization). This disconnect is entirely palpable as nothing more than that temporal lag; retail sales in the US continue to be among the worst in the entire quarter-century series yet the inventory imbalance is maintained as little more than some shift in holding periods in the supply chain. Already, factory orders suggest a recessionary environment close to that of the trough of the dot-com bubble yet with an inventory problem close to that of the Great Recession. That goes a long way to explaining these massive divergences, where the lag between sales slowing and production following is highly elongated (in a microcosm of what is surely an overall elongated business cycle dating back to that 2012 slowdown). If consumers are being squeezed in, say, a huge increase in household “services” spending, such as rent, and that leads to a general and massive cutback in spending on goods, including non-discretionary, then that still amounts to a full recession in the making. Efficiency in spending matters as much as amount; the same is entirely true, unfortunately, for healthcare and health insurance. If there is and has been some “strength” in services, and I am far from convinced of that, it is clearly coming at the expense of spending on goods. In either case, including where economists wish to diminish manufacturing to just a 12% box, the net result is still the opposite of what everyone wants (and some still expect).